Spirulina is derived from freshwater algae, smells a little ocean-ish, like seaweed. 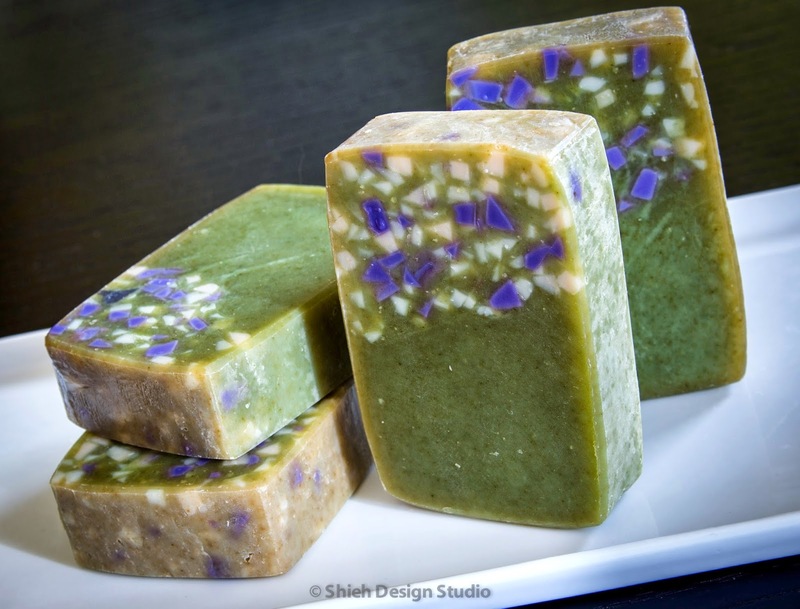 Using it to color cold process soap will give you a rustic more olive green color. 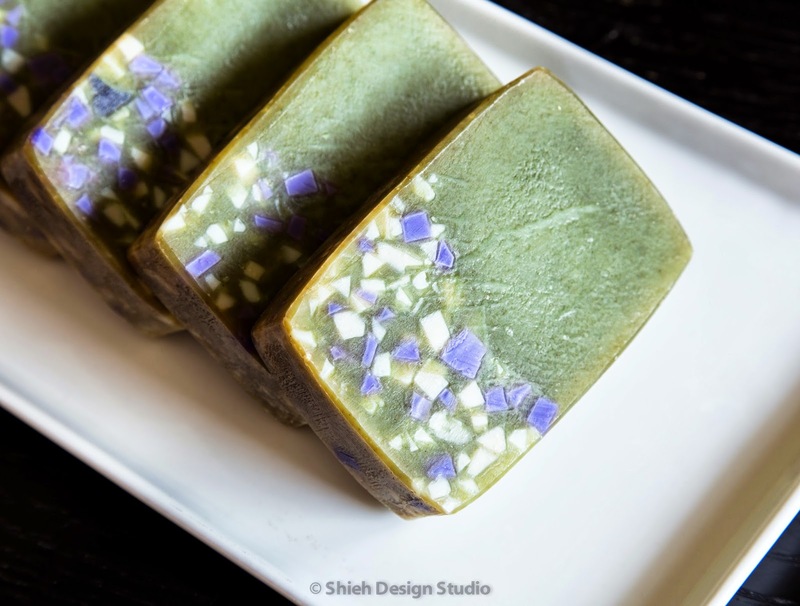 I was afraid that the fishy scent will effect the final smell of the soap, and since I'm using natural colorant I thought I might as well use essential oil to scent. Have you heard of 4 thieves? It's a blend consists of lemon, eucalyptus, rosemary, cinnamon, and clove. There are many variations, you can mix up to your taste. I also added some grapefruit to sweetened it up a little. 4 thieves oil has a very interesting story if you want to read: Thieves Oil History This blend is said to be highly antibacterial, antiviral and anti-infectious, should be great for soap! 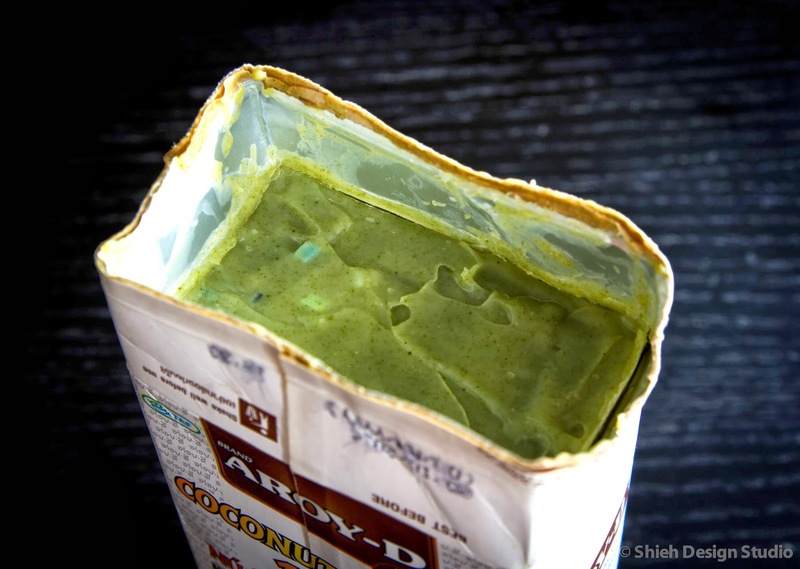 The mold I used to make this soap is FREE. 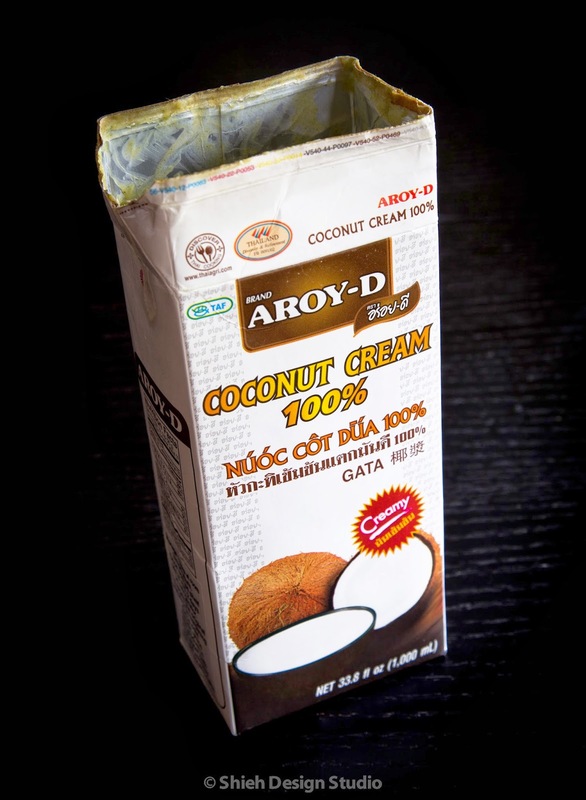 It is the empty carton of coconut cream I use for cooking and soap making. It is a bit hard to unmold, I just teared it up piece by piece. Can I call this recycling too?! I hope this green won't turn brown! As I mentioned in that post, cream soap needs to "rot" for at least 6 months, almost like aging the wine. Since this is my first time, I'm curious on how fast (or should I say slow?!) 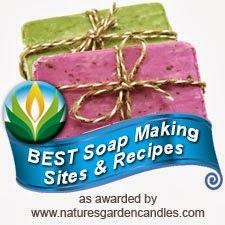 the soap quality and feel changes over time in order to understand the need to "rot" that long! Here I am, 10 weeks later, checking up on my container I hide away in a dark cabinet. My first impression is how dense it became, as if it got dehydrated. There is a pearl sheen on top, but the soap is turning a little translucent. It is very hard to scoop it out, almost bend my stainless steel spoon! It's not hard as rock or anything, just very sticky like chewy taffy. I went ahead and mix a bucket of aloe juice from my aloe 200x concentrate and kept on adding to the cream soap while attempting to whip it with my handheld electrical mixer. By the time it is fluffy just like the way it supposed to be I think I've added just about 1:1 ratio of aloe juice to cream soap base. I have no idea if this much of liquid added would cause any volume collapse, highly likely. But it still got a long way to "rot", maybe it would get dehydrated again by the end of 6 month rotting period. We shall see. For now, I want to test it to see how it can perform. 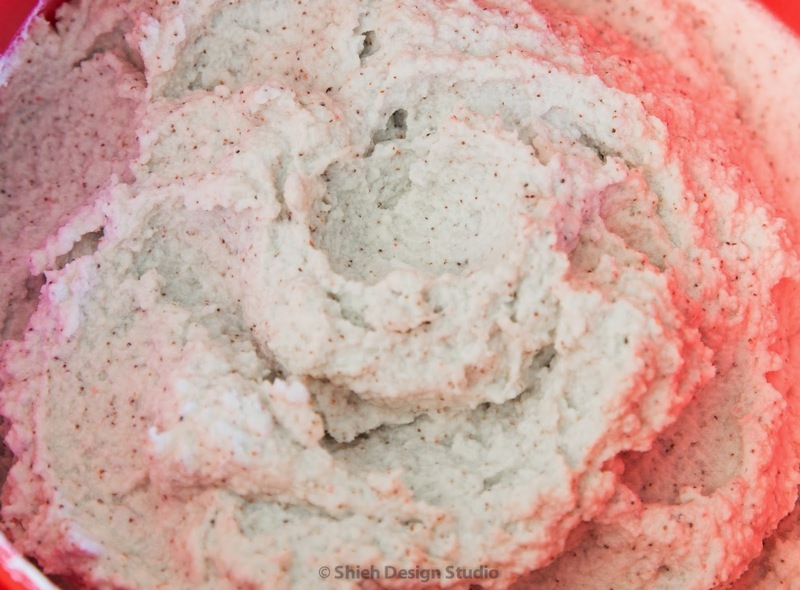 I scooped a small portion and added some exfoliants like sea salt, walnut shell powder, and jojoba beads. Nice and thick and creamy. I used some right the way just to see how it feels. I was a little disappointed. It got the job done, exfoliated my hands and washed clean, but squeaky clean, which means harsh. 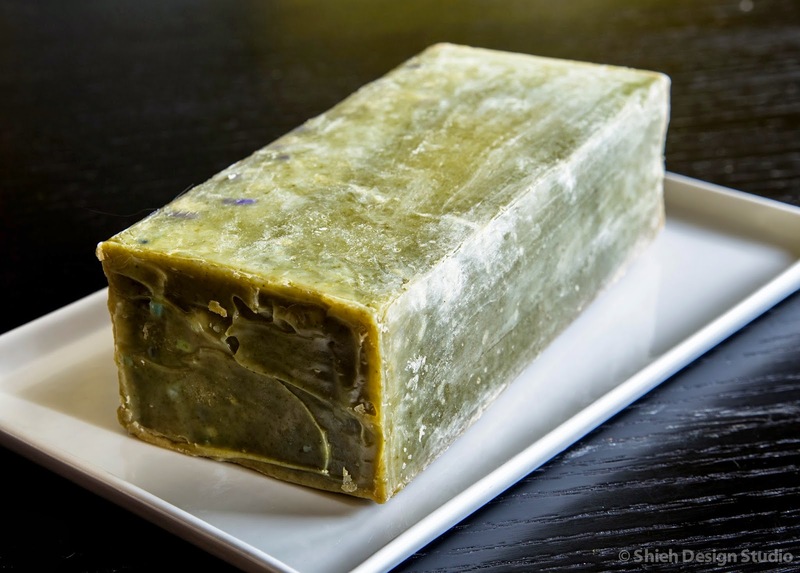 No soap should be squeaky clean, that is a scam from big commercial companies who make chemical body wash. A good soap should clean but still leave your skin feel comfortable, not tight. I'm only a little disappointed because the result is expected, I knew it is too young still to judge it's full potential. Until next time, I have high hope still. After 270 blog posts later, I find myself having a blogger's block, sort of like a writer's block. Gosh, what else can I write? My mission for this blog is alway to put out there in public something informative, never just about pretty pictures or what I have been doing lately. I want my followers to learn something from reading each post I write. You can always write to me any suggestion you have, I love to hear your ideas. But please, please only after you've seen all my post and if you still can't find what you are looking for, I just might take up the challenge! Now back to this post. I was chatting with one of my online soapy friends one day and she told me to revisit my old posts and maybe just maybe I'll think differently towards an old idea or technique and reinvent myself. This is about me reinventing, sort of. 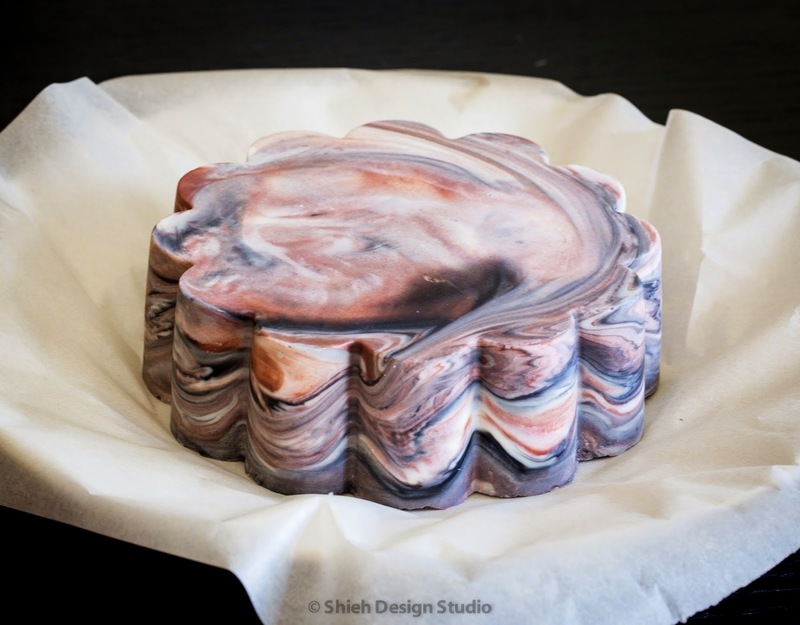 There was a period of time when I was obsessed about combining melt and pour soap base and cold process soap. I was interested in that contrast between solid (the cold process) and the transparent (melt & Pour). Since then other techniques took my attentions away and I have not made one for a long time. 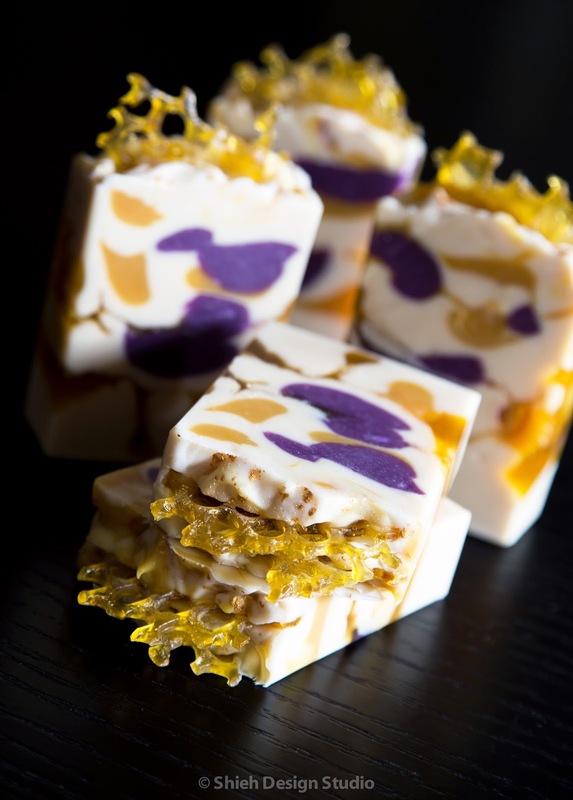 This one is called Wild Honey Soap. 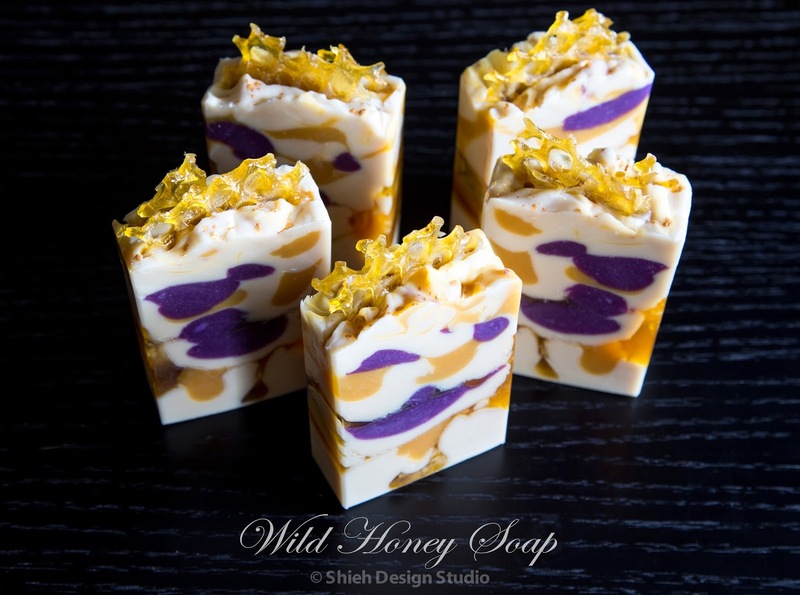 I used the clear melt & pour soap base and colored it deep gold which is perfect to represent the wild flower honey. 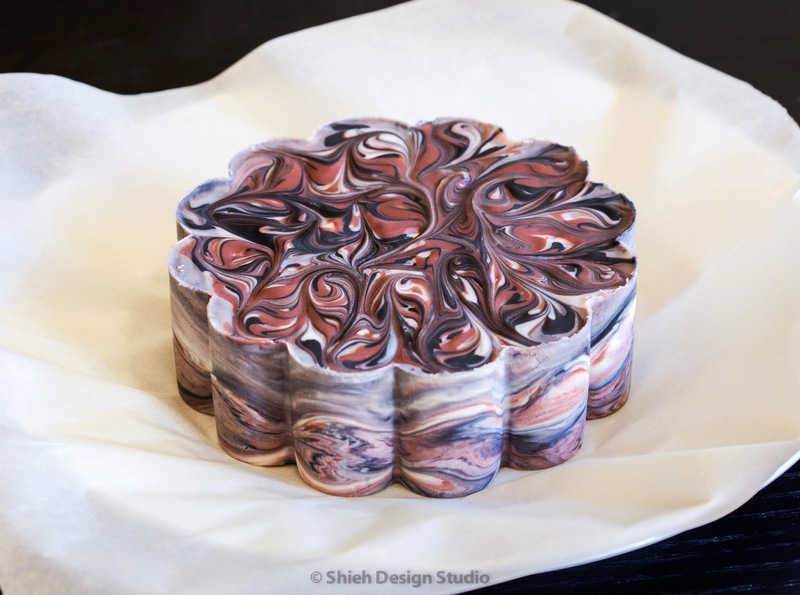 Well, swirling in hot melt & pour soap is nothing new, so where is the reinventing part? 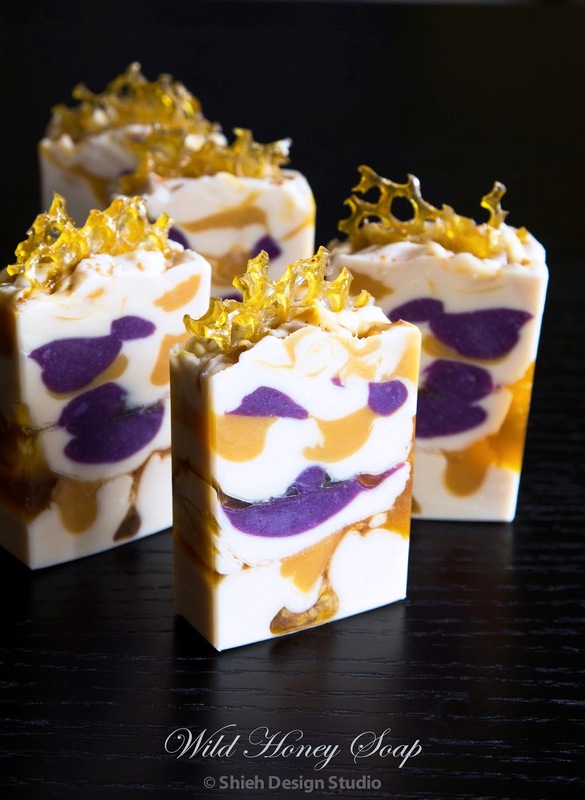 Do you see the honey comb crunch pieces on the soap top? I used a sheet of bubble wrap as mold and poured melt & pour soap directly on the bubble side then peeled off into small pieces when it's completely solid. 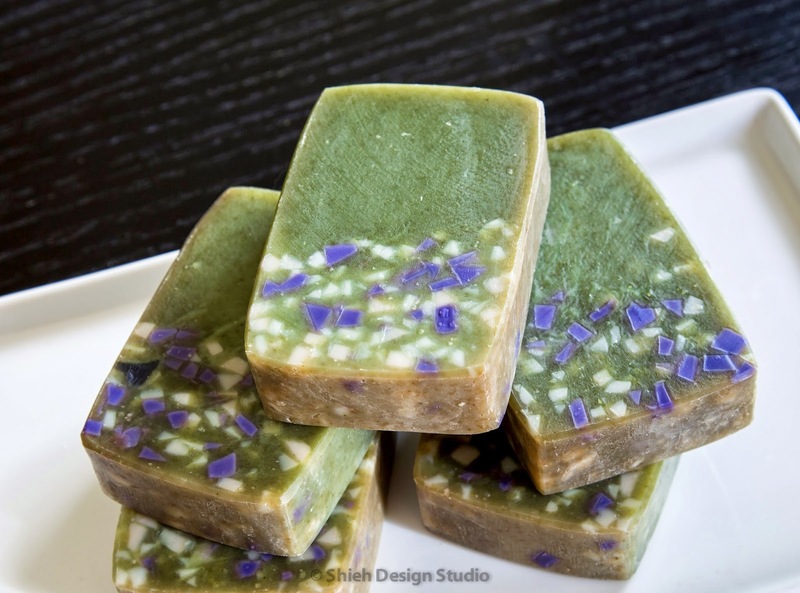 This soap is made with coconut water and of course local unrefined wildflower honey. 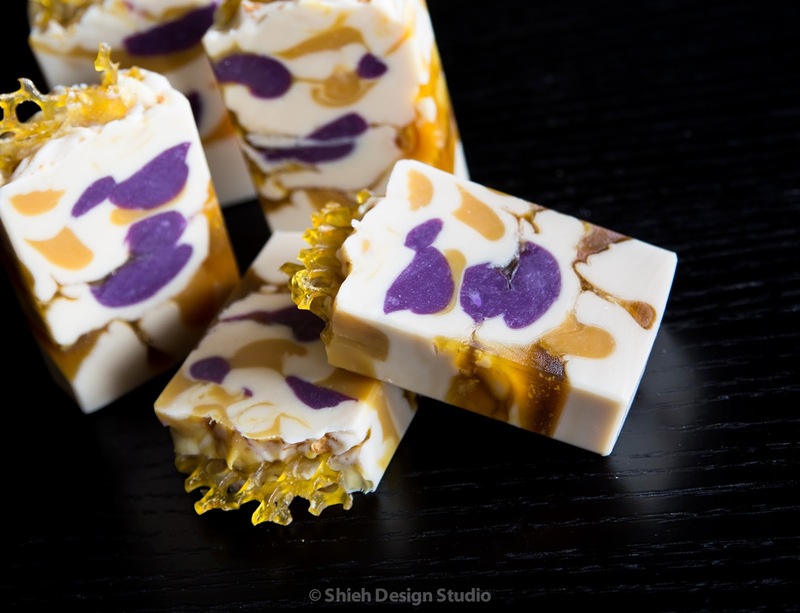 It's scented with a fragrance blend of sweet honey and wildflower. 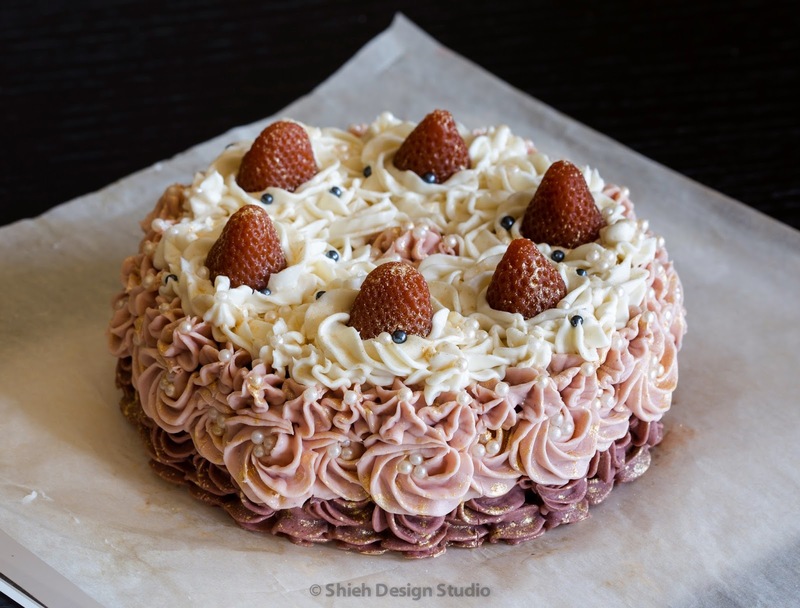 Soap cake making definitely takes more time and requires more attention to details and planning, pretty much like baking a real special occasion cake! It's so time consuming plus the fact that people always think it's too pretty to use that makes me not wanting to do more often. 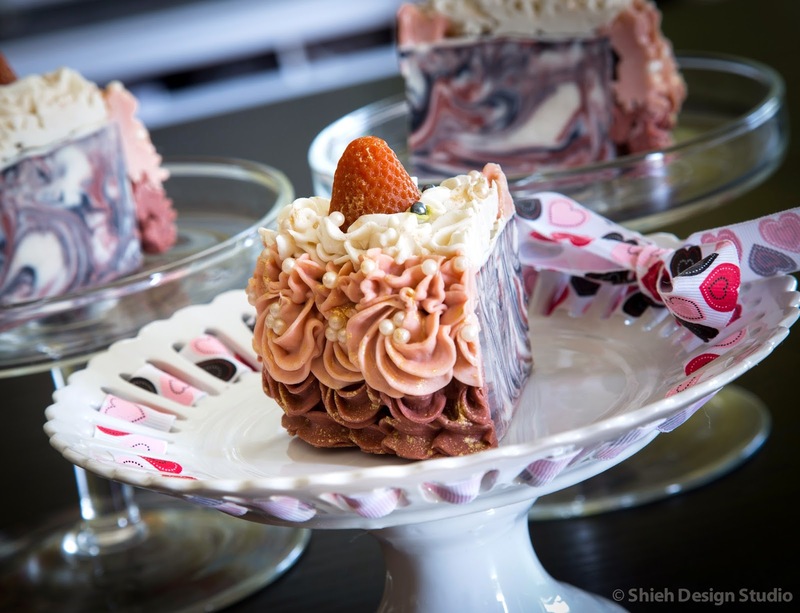 The easiest soap cake is done all in one step, pour the cake and make enough soap batter to set aside for pipping. But then you see the bare sides when you cut into slices. I wanted to try more like a real decorated cake, make the body first then pipe the whole entire outside. In this case I cannot do it in one step. I have to pour the cake body first, have it firm enough to take it out of the mold the next day. I really like this marble look, felt bad to move on to the 2nd stage of covering it up with "frosting". But everything was ready and waiting to go. At least I took some pictures before I covered it up. I meant to pipe rosettes all over the cake sides and top but the pipping tip I have is too big for the job. It looks so easy watching youtube videos of pastry chefs decorating their cakes but when I actually did it myself... oh boy. 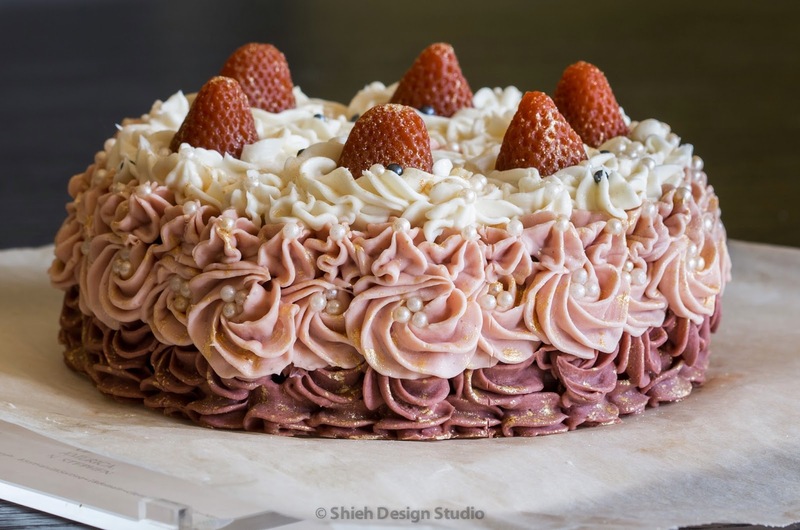 Dilema when cutting, couldn't see where to cut, had to constantly look under the cake to find the inner points of the "petal" shaped cake. Drawing cut lines on top of all that pipping is proven difficult. 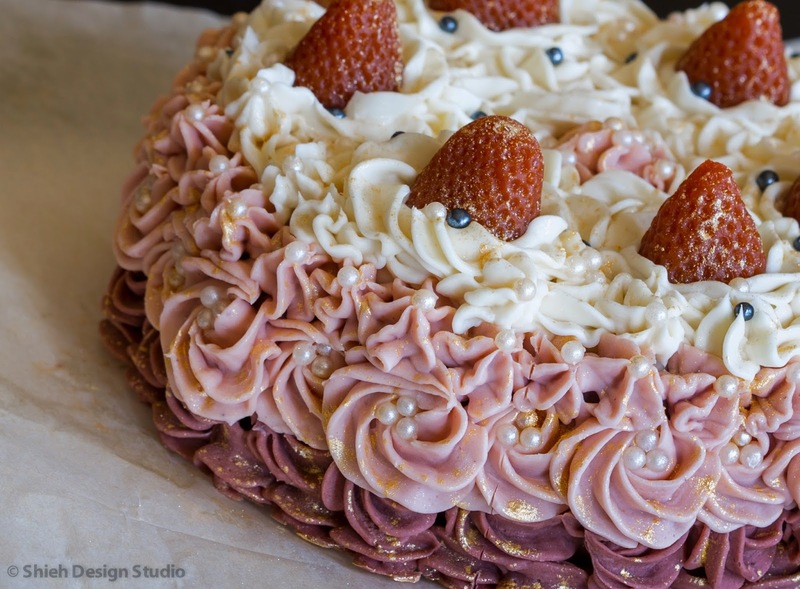 It looks very pretty, but I don't know if I would decorate a cake this way anymore. I have to agree with my husband, it is so not practical! I'm tired of spending $$$ buying expensive facial products. I really NEED those potent actives, yes, I'm aging badly! Time to do some research and source ingredients myself! As always, the first thing I research is based on natural thickeners. 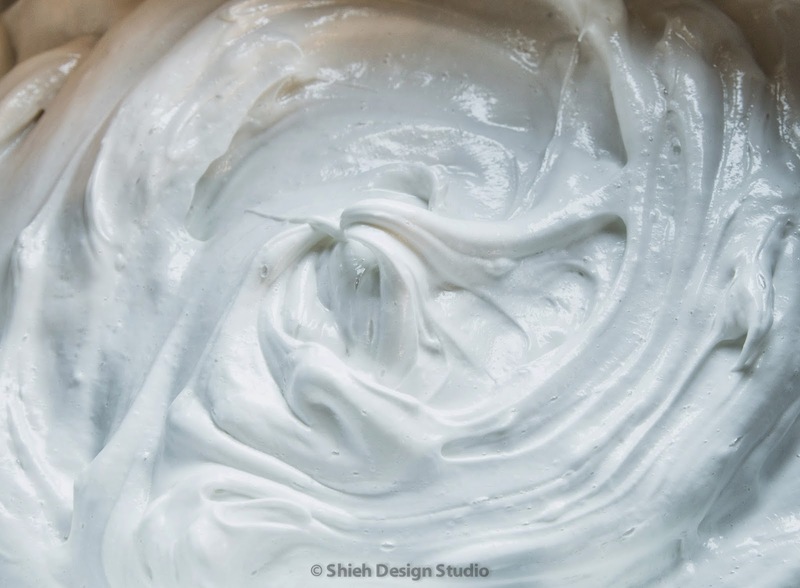 There are 3 general natural thickener (gelling agent) group in bath & body products: starch, gum, and cellulose. Gum has the most variations, you can find all kind of different gums. 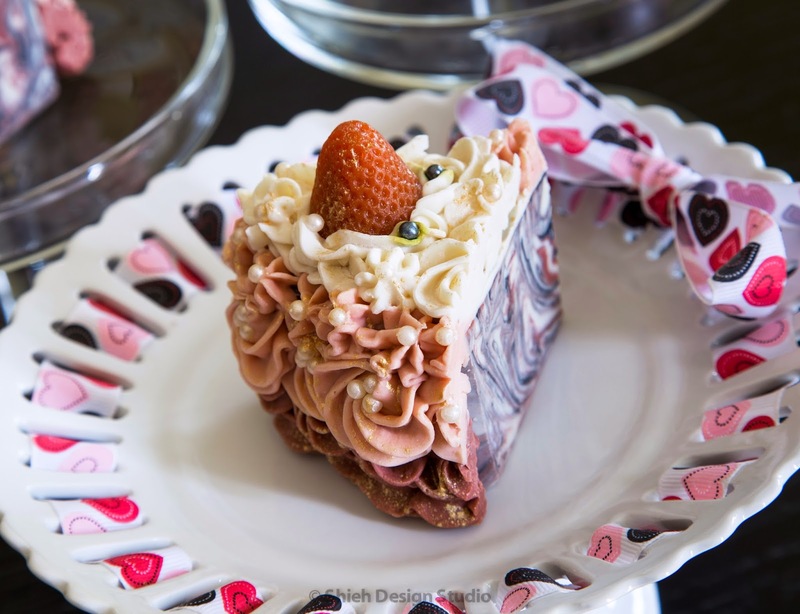 The most common one is Xanthan gum, it's used widely even in the food industry. Personally I don't like Xanthan gum, it is hard to mix and gives a somehow sticky after feel. 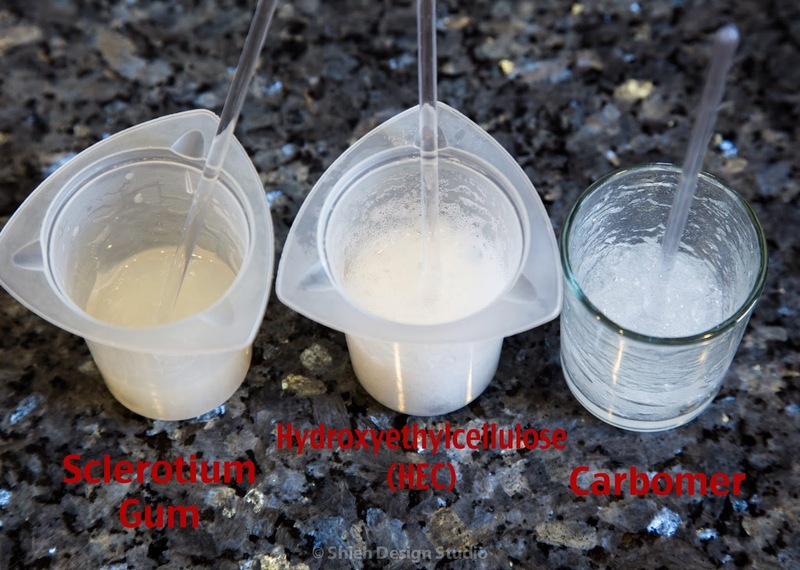 After researching I nailed it down to testing 2 natural thickeners and one manmade: Sclerotium gum, Hydrocyethylcellulose (HEC), and Carbomer 940. Sclerotium gum is the easiest to mix but it's also the runniest and semi opaque with a yellow tint. I found no specific instruction of how to mix HEC except it's soluble in water... sigh. It would not gel when I simply just added in room temperature water. General rule with natural thickener, heating up usually help. After I heated up the HEC mix it started to gel, but it gelled in lumps on the bottom. In the attempt to even out the clear lumps it trapped air into the mix and foam is what I got at the end. I tried it 2 times, one time mixing with a small frothier the other simply by hand. Both cases produced foam and stayed foam. Carbomer 940 performed the best but it's manmade. It is potent, only a little is needed and it stayed clear and even held the mixing stick right side up 90 degrees! 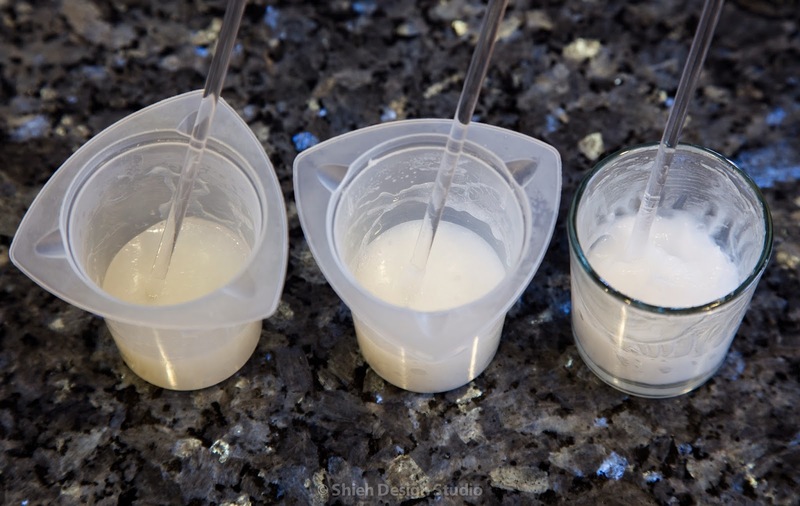 The next step is to see how emollient (oil) holds up and suspends in the gel formation. The main goal for this experiment is ultimately to allow me to add extracts and potent retinol (AHA or vitamin A) which is in oil form. In my test I used Meadowfoam oil, no specific reason, I just like the feel of body products made with it. I added very small percentage in each gel container and gave a good mix. Sclerotium gum mixed very well, thickness stays the same, but separation happened 5 minutes later. HEC and Carbomer both got significantly thicker, surprisingly, and turned white. HEC mix became foamy and stiff, but both no separation at all. I wanted to know how much Sclerotium gum I need in order to keep the emulsification stable so I double the amount. 2 hours later all 3 stayed stable. Side note, I forgot I have some Maize Thix (modified corn starch) so I tried the same experiment with it too afterwards, but same separation happened. I guess gum and starch are just not meant for emulsifying water and oil. Besides the compatibility and stability issue, it's how it feels on my skin that counts. All 4 test mixes spread easily on my skin. Carbomer got absorbed slightly faster than all natural thickeners and left no trace. All natural thickeners imposed slight stickiness and white streaking while applying. Natural thickeners also left barely noticeable shinny shin (like a film) on my skin when reapplying while Carbomer stays matte. My conclusion is, I start to wonder why I'm so insisting on using a natural gelling agent. All the potent actives I plan to use in my facial gel are lab developed anyway. Natural substance in my opinion is just not as potent in anti-aging field. What specific potent actives am I putting in my facial gel you ask? Retinol (best cell regenerator) is one which I already stated above, and others like Hyluronic acid (super hydrator), Tripeptide-5 (collagen booster), and AHA complex (5 different Alpha Hydroxy Acids). Fancy enough?